azstarnet.com: "Fewer illegal immigrants are crossing the border multiple times in a single year, never-before-released government numbers show. The percentage of people apprehended two or more times by the Border Patrol within the same fiscal year - known as the recidivism rate - has declined each of the last four years, shows a new report from the Congressional Research Service. The rate was 20 percent in fiscal 2011, down from 28 percent in fiscal 2007, the report says. ... 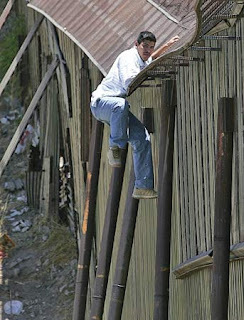 The report also reveals that nearly 60 percent of apprehended border crossers are being sent home through programs intended to make it tougher for them to cross again, and that fewer than 1 percent of all people apprehended by the Border Patrol have been convicted of major crimes. The report is the latest metric indicating that the flow of illegal immigrants, especially from Mexico, has slowed." Houston Chronicle: "When U.S. immigration agents scoured the hiring paperwork on file at Advanced Containment System Inc. last year, they found identification cards supposedly issued by the "Texas Department of Safety." Words including "identification" and "department" were misspelled. One ID card even had the words "novelty item" typed on the back. Some 44 percent of the company's Houston workforce from 2005 to 2009 was in the country illegally and was paid an estimated $2 million during that time, the audit showed. On Tuesday, U.S. immigration officials and federal prosecutors announced they had reached a $2 million settlement with ACSI in exchange for avoiding criminal prosecution." Reuters: "A federal judge sentenced a busload of passengers to prison terms of up to three years for their role in a foiled smuggling operation to ferry more than $3.1 million in cash into Mexico, U.S. Attorney Kenneth Magidson said on Tuesday. The sentences came after federal agents stopped a southbound commercial bus at the Hidalgo, Texas international bridge, about 240 miles south of San Antonio, in September 2010. U.S. Customs and Border Protection officers searched 17 pieces of luggage on the bus and found cash stuffed inside deflated Coleman air mattresses packed in each bag, a criminal complaint said. Agents seized $3.19 million in cash from the bags and arrested all 13 passengers aboard the bus. The passengers all admitted to their role in the smuggling ring, saying they were recruited to move the cash into Mexico. They expected to be paid as much as $8,000 to courier the currency across the border." Fox News: "Two men pleaded guilty to buying guns that were destined to be smuggled into Mexico, the first convictions in the federal government's botched Operation Fast and Furious. The men were so-called "straw buyers" who acknowledged purchasing guns that they knew were headed to Mexican drug gangs. ... Jacob Wayne Chambers and Jacob Anthony Montelongo each pleaded guilty in federal court Monday to a conspiracy charge. Montelongo also pleaded guilty to dealing guns without a license. The pair admitted being part of a 20-person smuggling ring that is accused of running guns into Mexico for use by the Sinaloa drug cartel." AP/NYTimes.com: "Officials said that five police officers had been fatally shot after they stopped a vehicle in a town outside Mexico City. A prosecutor, Alfredo Castillo Cervantes of Mexico State, said the police officers from the town of Ixtapaluca had stopped the vehicle on Monday when a taxi and a van pulled up and a group of attackers opened fire with high-powered weapons." upsidedownworld.org: "In the midst of Mexico’s senseless “Drug War” and the erroneous belief that drug-trafficking is the root of the country’s evils, Mexicans were given a powerful reminder last week of the deeper crisis affecting their fellow citizens. A video posted on social media sites concerning a severe drought in the state of Chihuahua saw the extreme poverty and malnutrition afflicting the region’s indigenous population highlighted in the media for a brief few days. Chihuahua, a vast, dry and mountainous state bordering Texas and New Mexico, is home to several indigenous groups, the largest of which, the Rarámuri (or Tarahumara), inhabit the region surrounding one of Mexico’s most spectacular natural wonders, the Barranca del Cobre, or Copper Canyon." Stratfor: "Over the past year it has ... become evident that a polarization is under way among (Mexican) cartels. Most smaller groups (or remnants of groups) have been subsumed by the Sinaloa Federation, which controls much of western Mexico, and Los Zetas, who control much of eastern Mexico. While a great deal has been said about the fluidity of the Mexican cartel landscape, these two groups have solidified themselves as the country's predominant forces." Now people can shift to United States of America with in 1 year us citizenship and immigration services are providing opportunities for those who want to move from one country to another.